India’s most well-known car designer, Dilip Chhabria, and his design house, DC Design, are known for their outrageous modifications of some of the most popular Indian cars. The man, most famous for creating the first prototype of the Aston Martin V8 Vantage, has also come up with the country’s first indigenous sports car, the DC Avanti. Meanwhile, DC Design continues to do what it does best, customize everyday cars to make them look. . . errrr. . . weird. Seen here is a modified version of the last-generation Maruti Swift. This custom package is priced at INR 2.65 lakhs (plus taxes) and will take around 40-45 days for completion. Read on for more on this modified Maruti Swift. 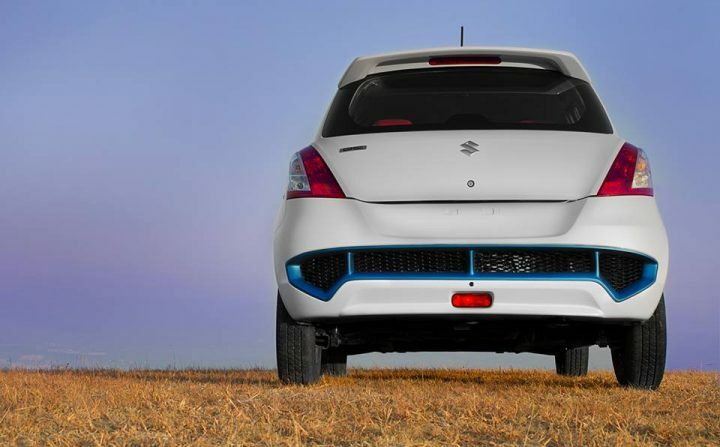 Let’s first talk about the exterior of this modified Maruti Swift. The front-end is where you will observe the most number of modifications. The front bumper has been completely reworked with different fog lamp housing flanked by LED daytime running lights. It has been finished in black and white with blue highlights and the DC Design logo replaces that of Suzuki’s. The rear bumper gets black mesh inserts highlighted by the same blue shade seen on the front bumper. The Suzuki logo remains intact on the bootlid and the DC Design logo stuck to the left-hand side. Since no pictures of the side profile of the car have been published we’re guessing they have not made any changes to it. Although, they would have probably added new rims. The headlamps and tail lamps have been left untouched which is very surprising. 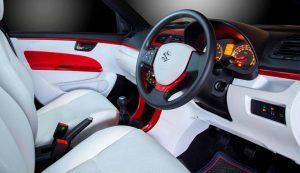 The interiors have been done in a very ‘in-your-face’ combination of black and white with red highlights. The choice of red highlights is strange considering the front and rear bumpers get blue highlights and one would expect the paint scheme to continue on the inside as well. 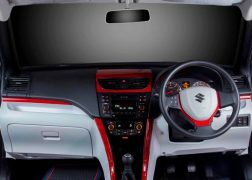 Red highlights can be seen on the steering wheel, above the glove box, on the centre console around the A/C vents and the door pads. The upholstery is completely white and unexpectedly, misses out on red highlights. The interiors look a bit gaudy, but on the plus side they now match the seat-belt buckle. At INR 2.65 lakhs, the asking price for this modified Maruti Swift is a bit steep for what you get, rather awful cosmetic changes without any additional kit or mechanical modifications. We can only hope for a good build quality and get your car customized by a reputed firm such as this one is surely a better idea than getting cheap customization done which might fall apart in a few years. Going by the ugliness of this car, we really wish the so-called design expert stays away from the new Swift. What do you feel about this modified Maruti Swift from DC Design? Do let us know by sharing your thoughts in the comments section below.